Former Park City resident Greg Ragland, who has lived in Ivins for the past three years, will show two new paintings — a diptych, or a two-panel pice, called “Avignon France” and a horizontal called “Park City” — in the show. The works mark a departure for Ragland. 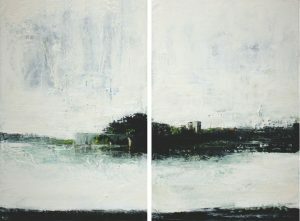 Both works abstracts were inspired by Ragland’s travels. 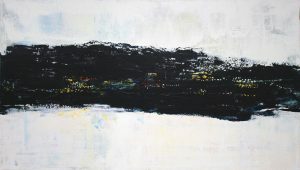 The medium for both pieces is acrylic-based, but also features elements of multi media. “The surfaces are more developed than in the past because I have created textures on paper and other materials and attached them to the canvas by laying paint over them,” Ragland said. “Once I attach the textures, I layer over them more or I scrape back to reveal the color through the other paint. “I also did them in a way that if you wanted to, you could turn the paintings on their sides and they would still work as abstract works,” he said.